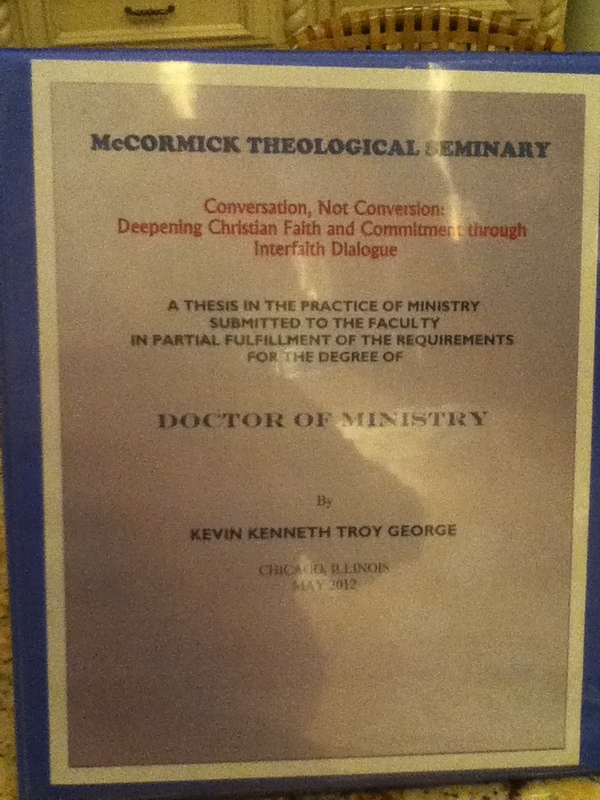 Three years ago I started a Doctorate in Ministry at McCormick Theological Seminary. It has been a great journey. Today and tomorrow I am engaged, along with my peers, in Oral Examinations (Often called a Defence) of my Thesis. Conversation not Conversion: Deepening Christian Faith and Commitment Through Interfaith Dialogue is a paper that argues that we can become more faithful to our baptismal covenant when we engage those of other faiths. I am looking forward to having a conversation with the panel tomorrow and learning more about my subject matter. The collective wisdom of the group will, no doubt, give me more clarity on my subject matter. It is hard for me to believe that these are my last two days! At times I have been asked by others and at times I have asked myself, why it was necessary for me to ‘go back to school?’ Tis a good question for sure. I think Christian Nextell Bovee was on to something. Minds are apt to rust out and not wear out. No matter what our vocation is, we all need to be learning, always! It was 15 years ago that I graduated from Huron University College. At that time, I wanted nothing to do with education. At 27 I had been in school for 22 years of my young life. Naively, I thought that I was done with learning. I discovered very quickly, that if I was going to get anywhere, I had better accept that my schooling was far from complete. Every day, we have opportunity to open our minds to the Great Teacher who is offering teachable moments as we journey. Learning has become an important part the journey for me. Every opportunity to learn is an opportunity to be a more faithful follower on the way. So after thirteen years away from institutional learning, I found McCormick. It has been a place where I can engage in the day-to-day place where learning is most profound, the people of God – the Church. While we are together three times a year for residential learning, the program at McCormick really focuses the practitioner of ministry on the local faith community to which he or she belongs. Therefore, while I have been busy studying etc, the people of St. Mark’s by-the-Lake have also been engaged in learning. It is a great model. The DMin. Program at McCormick is having a direct impact on ministry at the grass-roots level, while at the same time allowing practitioners like myself to try to ward of rusting minds. The relationships that have been forged in interfaith circles in Windsor Essex will provide many opportunities for our church to continue to faithfully follow Jesus by being in better relationship with people of other faiths. The learning continues, and I am grateful for the opportunity that I have had this past three years to focus my learning into a program at McCormick which is helping Christian communities find a richer expression of being pilgrim church. I am thankful top God and thankful to so many…. To that end I thought I would share the ‘Acknowledgement’ section of my paper! These past three years have been the most rewarding of my ministry. My time at McCormick has been a great gift. My gratitude begins with the Dean of the Doctor of Ministry Program, the Rev’d Dr. Jeff Japinga, for his patience, guidance, and direction in finishing this doctoral thesis. I would also like to thank the faculty, guest lecturers, and the staff of McCormick for their instruction, for their support, and for challenging me to be a more effective practitioner of ministry. I offer my gratitude to my colleagues from “The Bridge.” Your support and shared learning has been a gift that has allowed me to see different faces of Jesus. I wish to thank Dr. Wayne and Ms. Susan Paprosky for opening your home to me in Chicago and for your kindness, generosity, encouragement and hospitality over the past three years. Support away from Chicago has also been tremendous. The people of the parish of St. Mark’s by-the-Lake have been a constant support and willing participants in the many activities that have been planned after each course. Thank you for your patience with me and more importantly for your unbelievable ability to bear witness to the Gospel. A great deal of my writing was done at Boston Pizza, Tecumseh, in booth 113. To Rob, Kirsten, Chris, Kelly, Jessica, and your staff – thank you for giving me space, food, and cheerful support as I wrote. I wish to express my gratitude to my father Robert J. George and my mother Vivian for instilling the gift of faith in me, and for giving me a great love for the Church. Dad, I miss you terribly and know that you are with me always. I am grateful to my siblings, James, Helen, Elaine, Lloyd, Robert and Darryl and to their spouses for the love and support they have shown me over the years. Throughout this time of study, I am particularly grateful to Helen and Darryl for the hours of listening and offering advice when it was needed most. To my wife and confidante, Catherinanne ~ those closest to us see us at our best and at our worst ~ I am forever indebted for your love, attention, advice, patience, reassurance, and for your countless hours of editing. Thank you for giving me a friend in “Back to School George.” Curious George has been faithfully by my side from start to finish. I am fortunate to have a wife who shows such wonderful love and support. Keeping you in thoughts and prayers always but especially Tuesday as you defend your thesis. It is remarkable that you have journeyed this 3 year path while while carrying our your ministry to all of us with dedication, devotion and love. Thank you. Will be thinking about you while you are in Chicago. I can’t believe how quickly the three years have gone by (for me anyway!) You have many supporters behind you hoping you do well tomorrow. Good Luck! Kevin, You are always in my prayers. We know that you will do well in whatever you apply yourself to. Yes, Dad would be very proud. Kevin – you are always in my prayers but especially today! working hard! – Thank you! Congratulations – the next time you walk into B.P – they will be saying”The Doctor is in”! You guys were simply the best! 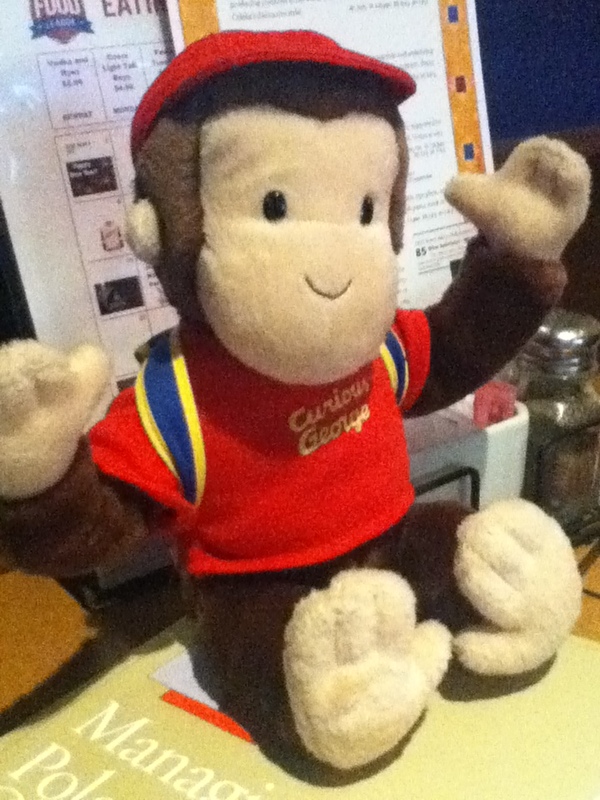 I love Curious George and that video at the end. Just back from Rome – hope all went well, as I am absolutely sure that it did. thanks for the reflection and the inspiration.